Terms & Conditions of Let for Glamping The Wight Way Ltd Safari Lodges. Reaching us couldn't be easier, we are just an hour or two from London, a short trip across the Solent by ferry or hovercraft brings you to us. There are up to 200 Isle of Wight ferry crossings a day operating from Portsmouth, Southampton and Lymington. The closest car and passenger ferry routes to our site is Lymington to Yarmouth operated by Wightlink alternatively Red Funnel operate a car passenger service from Southampton to East Cowes. We are able to offer a discount code for both Red Funnel & Wightlink ferries once a booking has been made with us - ask us for a code. Southampton T1 < > East Cowes - crossing time 55 mins with daytime departures every 60 mins. Southampton T2 < > West Cowes - crossing time 22 mins with daytime departures every 30 mins. Hovercraft - The Isle of Wight boasts the only foot passenger hovercraft service in the UK, which runs from Southsea in Portsmouth to Ryde Esplanade. Even if you don't travel to the Island by Hovercraft, it is worth taking a return trip during your stay, just for the experience. The SatNav friendly postcode is PO40 9DE. 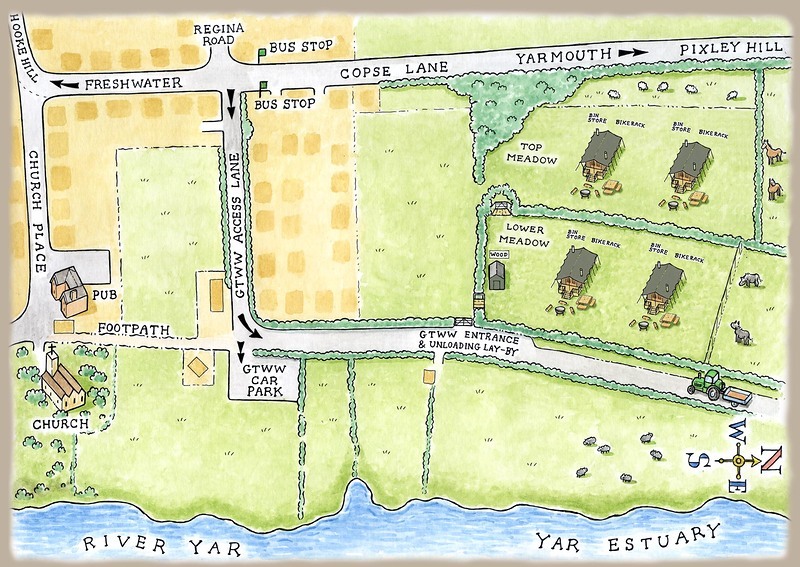 From the Yarmouth Harbour and ferry exit point, turn right at the roundabout and cross the River Yar. Follow the A3054 towards Freshwater, as it bears left & after approximately 400 yards take the left turn into Pixley Hill. Continue as this road changes onto Copse Lane heading into a small residential area. You will pass Redlake Road and Ronstan Gardens, the next left turning is our un-named lane - opposite the turning for Regina Road. Our signs are visible at the entrance to the lane, next to the bus stop on your left. Take the lane to the corner from where you will see our private car park ahead. This is where your cars should be parked for the duration of your stay, however for unloading and loading purposes, there is a lay-by further along the lane (300 metres) at our site entrance gate. Arrival Time is between 4pm - 7pm, please let us know when you board your ferry by texting 07585 956141. It is very important to plan to arrive at the site during daylight. Settling in to your canvas lodge will take some time, from unloading your luggage to going through the welcome and safety briefing including the operation of the wood burning stove & water heater. As we are off-grid it is necessary to do this during daylight hours. Both wood burners take about half an hour to heat up, this will give us enough time for us to get to the site, heat up the oven & hot water ensuring a warm welcome for you - please let us know when you board your ferry for this reason. We will issue guests with the gate code, safe code and keys to the lodges on arrival, so again, please let us know when you have boarded the ferry to ensure that we are there to greet you. Please can you strip the beds and leave the accommodation in a clean and tidy condition. This is the best way to ensure you have gathered together all of your belongings. Please wash-up, empty all bins & put them in the outside bins. You are required to ensure that the oven, kadai fire bowl & bbq are clean. There is a key drop slot in the chalet for you to leave the lodge keys. This is a very handy link if you've been staying in the New Forest. From Lymington Head for Lymington Pier. You can get here by train from Brockenhurst and Lymington Town. 5 minutes. Take the Wightlink ferry from Lymington Pier to Yarmouth. 40 minutes - ARRIVE AT YARMOUTH or continue and take the route 7 bus from Yarmouth Harbour to Freshwater or Gotland. 9-20 minutes - ARRIVE AT FRESHWATER OR TOTLAND. This is accessible from all parts of the country with direct links from London. Catch the route 7 bus. 35-60 minutes. This is the fastest crossing to the Island (foot passengers only). It's near Portsmouth.